This week, Angie puts a spotlight on Kurt Braunohler’s comedy career. If you or your comedy troupe would like to be featured on Stand-Up Tuesdays, please email utgjames@gmail.com. Well it’s about time. Today marks the release of the long-awaited debut comedy album from Kurt Braunohler, How Do I Land? via indie music label Kill Rock Stars, and more excited I could not be. Recorded earlier this year at packed rock clubs in Seattle and Portland, Braunohler’s mix of colorful childhood stories and musings on how to make the world a better place offers an hour of pure and silly comedic delight that is guaranteed to leave you grinning ear to ear. How Do I Land? takes its name from a mind-numbingly awesome idea Braunohler had that, thanks to the generosity of strangers, he was able to make a reality. 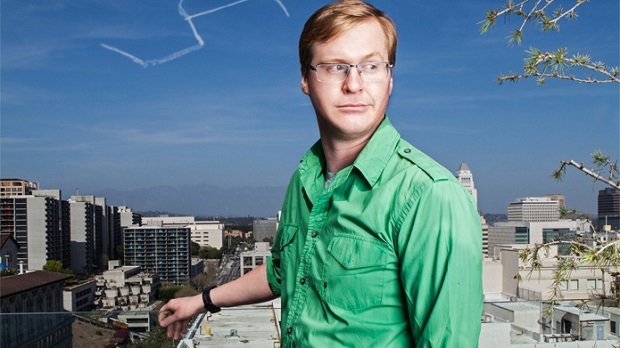 With funding from a Kickstarter project, the comedian successfully hired a sky-writer to spell out the CD’s name above Los Angeles. The result, naturally, went viral. Flipping brilliant. The first comedian ever to sign with the Kill Rock Stars label, Braunohler recently took some time to chat with me about the CD and pulling off the best prank in comedy history. UTG: You’re the first comedian to sign with the Kill Rock Stars label. Tell me what made you decide to partner with them. KB: It was probably when I was fifteen and my friend first played a Bikini Kill record for me in his basement. Kill Rock Stars had so many bands on them that were influential to me as a kid. I’ve always just held them in such high regard and getting to do a record with them was like a dream come true. UTG: That’s awesome. So you get to be a rock star yourself. KB: (laughs) Yeah, a very quiet rock star. UTG: I cannot believe you actually pulled off the sky writing prank. That was simply brilliant. KB: (laughs) I can’t believe we did it either. UTG: Usually, I’ll give Kickstarter supporters grief because I do a lot of fundraising to fight cancer, but I have to say – that’s money well spent. KB: Thanks! I can take that. Hey, somebody who does cancer fundraising just told me that this is fine! UTG: Are you going to be going on tour to promote the album? KB: Yeah, we’re just having a few record release shows. We’re doing August 27th in New York and another pending date for Chicago. UTG: Nice. What else is on your radar? I mean, the CD coming out is really exciting. KB: I’ve been doing this podcast recently called “The K Ohle” on Nerdist.com, which is a multi-format podcast so it changes weekly. One of the formats is called “Get Lost”, and it’s where I blindfold a guest, put them in my car, drive them somewhere they’ve never been, and then un-blindfold them and have them explore and figure out where they are. UTG: I remember seeing someone’s tweets about that not too long ago. That’s a brilliant segment. You come up with the best pranks. You really do – I’m going to have to call you next April. KB: (laughs) I think I’m also going to be taking out some billboards in small towns around America that are just like other versions of the sky writing but they’ll be more permanent. UTG: You should make a game out of finding them, like a scavenger hunt. KB: Oh, that’s a great game. UTG: Well, I’m very excited that you finally have a CD coming out – I think it’s long overdue. KB: I know, I’m really excited. I was just saying, it feels good to finally have a physical thing that I can point at and say, ‘This is what I do.’ It’s not so ephemeral anymore. An endlessly creative talent, Braunohler has been hailed as “a prolific stand-up comedian” by the LA Times, named one of Variety’s 2012 Comics To Watch and “One of the 50 Funniest” by Time Out New York. Kurt also continues to host and perform the live comedy variety show Hot Tub every Monday night at the Virgil with his comedy writing partner Kristen Schaal. He can also be seen as a regular guest on Chelsea Lately and can be heard on Bob’s Burgers. You can hear him on his podcast with new episodes every Tuesday with fantastic guests like Paul F Tompkins, Kumail Nanjiani, Nick Thune, Jon Daly and more. Let How Do I Land? inject a little bit of silliness into your routine and pick up a copy today from Kill Rock Stars.